After drawing a lava monster, he set out paper and a crayon on my desk for me to draw my own. As usual, I was focused on the tasks I wanted to accomplish that day, but something made me slow down enough to appreciate his assignment, and I drew a lava monster for him. The rest of that week, the three of us kept saying to each other, “I lava you … THIS much!” in monster voices of varying pitches. So, I decided to print my monster as a risograph at Outlet PDX, the studio and print shop run by Kate Bingaman-Burt, and turn the lava monster into a valentine’s day card. Risographs are like silkscreens, every color you want to print needs to be a separate drawing. Then, each drawing/color has to line up (register) just right, or intentionally overlap. I have no technology to do this for me, plus I had fun doing it by hand, but it took patience and multiple drafts. I could feel my brain rewiring itself as I tried to think of each color as a black shape or line. I cheered when the first color came out–magical to watch the monster go from black shapes on white paper to fluorescent orange and pink on pink paper. The final results made me so happy, I thought there must be others who will want to give this card to a loved one, a friend, a mom or grandma, or for Valentine’s Day. Now I have enough cards for my kiddo to give to classmates and a few to sell as well. Truthfully, and as some of you know, I don’t really love Valentine’s Day. I feel like it puts too much pressure on couples and singles. However, embracing it from a kid’s point of view and expressing exuberant love/lava has made it more fun. So, Valentine’s Day or not, I hope you have many people in your life who lava you a lot! 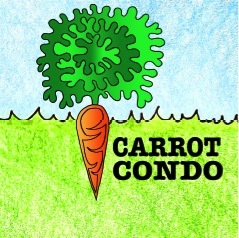 As always, thank you for reading and following me along at Carrot Condo. Your interest in my work keeps me motivated and happy.